In “Where Will the Seas Roll Up Their Thunder”, Kate Story speaks through a voice that is underused in fiction in generally, and especially in monster stories – the voice of an older woman who lives in a long term care home. This woman is having a conversation with a student about a topic that is generally unrepresented in fiction featuring older adults – the future. Story still explores ideas of the past and nostalgia, which are firmly connected to the representation of older adults, but she connects these not to the woman’s age, but to her status as a Newfoundlander, interested in Newfoundland history. Story captures the rambling quality of a good storyteller, willing to make connections between seemingly disparate ideas and willing to go into tangents and rants. She captures the magic of storytelling and links it to exploring the truth behind narratives. She interacts with key features of narrative like the feeling of being chosen (a theme that is over-represented in fantasy narratives) and the problematic quality of this theme and how it stems from a life that seeks significance when being underrepresented as a woman in canonical stories. Her unnamed older woman wants to have made an impact on the world around her, a significant change and not to be easily erased. She interacts with notions of truth and fiction and the assumption that older adults are indulging in fantasy if they mention the strange and unnatural rather than representing truths. Her narrator has access to truths that others ignore. She points out the interweaving of landscape and story by presenting her narrator uncovering truths located beneath the surface of the Newfoundland landscape and things hidden in plain sight. Story blends science and fantasy in her narrative, giving a new origin story for the tales of dragons and connecting past and future in a cycle of death and rebirth. Story connects the skepticism of the student researcher to the possibility of truth in a narrative inside of what seems to be a folkloric story. She highlights the multiplicity of truths and points out that “truth” itself is a story, always subject to revisions and changes. Holly Schofield’s “Weight of the World” explores the role of science in humanity’s engagement with our ecology. Schofield brings attention to the way that capitalism is constantly placed ahead of ecological research, pointing out that we endanger the planet further by devoting government resources to areas that we think will be more profitable and provide short term benefits rather than long term research that could develop solutions to ecological problems. Schofield’s tale centres on a scientist named Gurpreet who keeps getting shuffled from department to department while she tries to create solutions for humanity’s current eco crisis and food security issues. Changes in the gulf stream have meant that Canada has become a frozen wasteland where growing seasons are uncertain and always incredibly short. Gurpreet has to deal with misogyny from her male coworkers as well as corruption in funding models that takes money away from viable food production and funnels it into popular, but under-researched methods of producing food, even though these methods will likely have longer term ecological repercussions. Schofield’s tale is timed at a critical moment when we see a conflict between scientists in the United States and a government that doesn’t want to change its ecological policies. Her tale is a reminder to all of us that we need to invest in long term scientific research and stop having stop-gap methods that cause further ecological danger. Matt Moore’s “Delta Pi” is an Aurora-nominated short story that plays with the idea that math can be a spell as powerful as any invocation. Math is a language, a coded system, and reality imposes strict rules upon it, but math is also something that is seen to govern reality, a system that provides guidelines for interpreting the world. What happens when those guidelines shift? What happens when technology changes the basics of math? Does reality itself shift? “Delta Pi” explores technology that fundamentally questions and alters the nature of Pi, the mathematical constant that represents the ratio of every circle’s circumference to its diameter. When that number shifts, when technology alters it, the world, a fundamentally circular space changes and shifts. Our universe is left in a state of question when things that are structured as constants begin to change – the altered Pi is a gateway to the unknown. Matt Moore sets his story at a research lab where new technology is being tested. His protagonist is a teacher for the children of the lab techs and researchers in the experimental lab attached to the school. Gradually, through an experiment with the children, he finds out that Pi is shifting, the number ramping up from 3.14159 to 3.26, and then to 3.71… the coding underlying the universe’s constants is changing and this could have meaning for the entirety of reality. Moore explores the danger of experimentation and the power of math as a coded system, a language that has the capability for describing the nature of reality. In particular, Matt Moore’s protagonist fascinated me because of his disability, since few SF narratives deal in depth with disability. His disability is not revealed until later in the story unlike many narratives about disabled people that generally reveal disability early on and structure the entire person and their personality around their body. The significance of his protagonist’s disability is revealed most prevalently when the plot makes it relevant – when the nature of the circle, and thus the wheels on his wheelchair, are fundamentally shifted. James Bambury’s Thirteen Generations takes place in a realm of experiment, a lab in which specimens are put into a maze to test their ability to navigate complex locations and solve problems. Each specimen only lasts about an hour and passes on some of its knowledge to the next generation. The researcher gradually begins hearing disjointed voices from the organisms as they pass from generation to generation, their language becoming more clarified as they gain greater abilities to problem solve complex mazes. Gradually the specimens come to recognise the presence of the researcher, and later generations begin to ask for things. Over time, the organism starts to question its existence and asks the researcher if life is just paths, eating, and signals. It recognises the limits of existence, the simplicity of it and its meaninglessness. When the researcher tells it that its death is coming soon, it, like us, wants to avoid any form of death. When it discovers that death is not possible to avoid, it becomes despondent, seeing that there is no way that it can avoid or solve death. As the specimens continue to progress, they begin to question the necessity of their behaviour and what they are doing. Death’s inevitability and the repetitive nature of existence drains them of their motivation. Speaking to a creator and knowing that life is only a maze, a puzzle for the benefit of another robs existence of its excitement, its changeability and, by making death something inevitable, there is a loss of the speculative – the question that keeps us going. Change is motivational, questions help us to constantly strive, change, and modify the world around us. You can explore this story at http://aescifi.ca/index.php/fiction/35-short-stories/1400-thirteen-generations . You can find out more about James Bambury at http://jamesbambury.blogspot.ca/ . I want to thank Julie Czerneda for being willing to do this interview and for her enthusiasm for these questions. I am truly honoured that she took the time to participate in this interview. Ms. Czerneda’s work was an incredible source of inspiration to a friend and colleague of mine at Trent University, Ellen Bentzen. 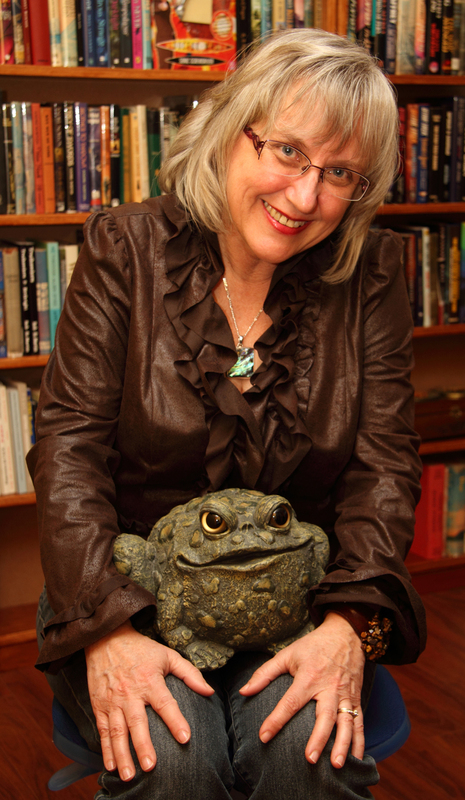 Julie Czerneda’s incredible ability to be equally comfortable in both the worlds of the sciences and humanities informed a lot of my discussions with Ellen about the interconnectedness of science and humanities discourse and I am hoping that this interview honours Ellen’s memory. Spec Can: Could you tell us a little bit about yourself to start this interview? 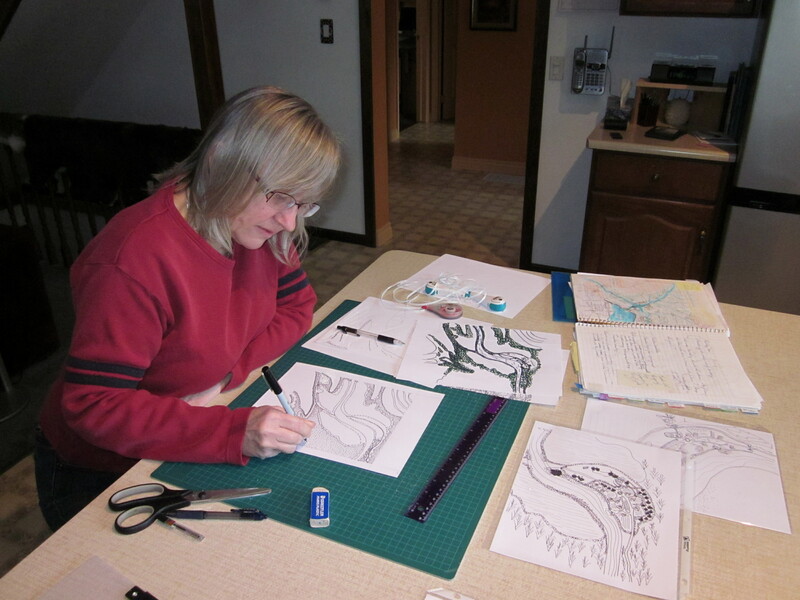 Photo of Julie Czerneda map-building by Roger Czerneda. Julie Czerneda: I was born on an air force base, spent my childhood in the Maritimes, then my teens on the shores of Lake Ontario. Met my other half (Roger) at the University of Waterloo, in Calculus class (but didn’t realize it until we were chem partners), married, then went to the Universities of Saskatchewan and Queens to study the evolution of chemical communication in fish. After working for a while at the U. of W. (life can indeed be circular), produced offspring and began writing biology textbooks, in that order. While in the midst of a successful career as an author/editor in educational publishing, someone (Roger) thought I shouldn’t write science fiction as a mere hobby but should actually show someone. Years later, having been introduced to fandom, conventions, and many folks of the Best Sort, my first novel was indeed bought by Sheila Gilbert of DAW Books, and I’ve been doing this for a living ever since. Yes, my life is insanely fun and I’d not change a thing. Spec Can: You were a biologist before becoming a Science Fiction and Fantasy author full time. What was the transition like? How do you straddle the worlds between academia and fiction authorship? Julie Czerneda: Thursdays. Seriously. While I still earned my living from non-fiction, I wrote fiction on Thursdays, and only then. I remember loving Thursdays. But that came later, once I was actually trying to finish something to, as mentioned above, show someone. I also used different desks. Where I worked on physics curricula or designed exams was there. Where I worked on imaginative, go with me or not, story-telling? Way over there. With posters of Godzilla and a subwoofer of unusual size. From the beginning, to me, biology and science fiction differed in degree, not substance. Biology filled me with wonder and curiosity. All science does. The universe does. Reading science fiction did that. Writing it? Ah, there was the legal, moral, and fun way to answer my own questions. I was hooked. Spec Can: In what ways can biology inform Science Fiction and Fantasy? How much do you rely on your repertoire of biological knowledge when you create your fantastic worlds? Julie Czerneda: Every way and in everything and all the time. Firstly, what I write, the stories I tell, come from what interests me. So there are cool real bits of biology everywhere in my stuff. I couldn’t make up the weirdness of real life. Secondly, I recognize the trust a reader places in me when they pick up one of my stories. They have a right to expect that I’ve done my homework, and what needs to be credible is. (Plus research is something I adore.) Last, and not least, the more I know about something, the more questions I have and the more intense my exploration of that idea will be. For Species Imperative, I spent five years reviewing biodiversity, salmon research, and the evolution of distinct populations before writing a word. I remain very proud of the result. Spec Can: What do you enjoy most about doing research for your novels? Julie Czerneda: Ah, research. It’s like that first cold beer on a hot afternoon. So satisfying yet potentially distracting. What I enjoy most is learning stuff. Any stuff. Particularly stuff I’d never thought about knowing before, although more about the familiar is fine with me too. Having to do research for a new story? Really? Does anyone think that’s anything but joy? For my latest book, the fantasy A Turn of Light, I spent wonderful hours and days and months delving into pioneer history, which was new to me. Antique lamps and razors. How to grease a barn door track or how freshly milled flour feels to the skin. For every piece I set out to learn, there’d be so much more I hadn’t expected. How recent in our history it was to have clean light for work at night. How new a concept to have separate bedrooms. The names of tools and how very old some are. I’d read letters written two hundred years ago and catch myself nodding with agreement or laughing, for the voice I was hearing in my head could have been that of any of my peers or friends. The distracting part? Research can seem like progress when, on its own, it’s merely an investment. It’s what you do with it that matters. Once I have enough stuff in my head to feel confident, I focus on the writing and avoid more research unless I need something specific. Case in point, Turn. I was well into the writing when I came to a scene where I needed to put something personal in my character’s hands that would show who he is now but also something of what he’d left behind. Reading what a military kit of the era should contain gave me the essentials. An hour’s pouring over images of antique razors, mirrors, and other personal items provided a sense of the real things. (Plus I dug out my Grandfather’s bristle brush.) I found links to descriptions of hard soaps and small ornate mirrors. The little scene that resulted is one of my favourites and does everything I could have asked, with significant charm. Spec Can: Why do you write speculative fiction? What drew you to it? Julie Czerneda: Curiosity. I turn over rocks. I long to see over hills. When I was 10 I read my first SF book (Andre Norton’s Star Ranger, now called The Last Planet) and realized there was fiction that did the same. I was hooked and never stopped. Spec Can: What experience first told you “I need to be a storyteller”? What Power!!!! I was a storyteller from then on. Spec Can: Ecologies – flora and fauna – play an important role in your work. What important role can ecological knowledge play in the works of SF authors? Julie Czerneda: Two, I feel. One is the obvious, that when world-building one should consider the life of a place. The other? Because nothing lives in isolation, an ecological approach gives a writer the opportunity to fit the puzzle together. To have alternative points of view and unintended consequences. All the intricate and messy ways things happen. Spec Can: A Lot of your work involves meetings between diverse species. What important role do you hope to convey to your audience about cultural diversity and perhaps ecological diversity? Julie Czerneda: The more the merrier! Or, in the case of living things, the more stable and resilient the community. It’s interactions that interest me. The interface between any two or more creatures is full of change and adaptation and lovely icky bits. In storytelling — and real life — I’d rather toss a problem at a group of people (or whatever I have in mind at the moment) who’ll each have a different approach to a solution, if they see it as a problem at all. That’s the joyful surprise of it all. I also have no problem letting my love of wild places show. Some writers love food or detailed descriptions of hardware. For me, it’s passages like those in Species Imperative that exist for no reason other than to show how much ours or any world with life risks losing if life itself is endangered. I heartily and passionately include us in there, by the way. I’ve never distinguished between the human fauna and all the rest. We’re part of the living landscape, simply a little too clever for our own good sometimes, but not always. Sometimes, we get it just right. That was the long answer. The short? Diversity is, to me, a sign of robust health and a source of possibilities, regardless of where I find it. Spec Can: Can SF and Fantasy have a role in changing people’s thoughts about the environment? Julie Czerneda: On their own, I doubt it. We pick what we want to read, so someone who reads my stuff, for example, will already be someone firmly a fan of slime. And nature. And messy compromise. That said, there are always stories that catch a wider audience. The film Avatar was exotic and new to non-science fiction readers (read Andre Norton’s Judgement on Janus for a familiar one), not to mention gorgeously made, so its message had to have an impact. I don’t write fiction with a message or intent to change anyone’s mind. I do it for the story. If someone nods along to that story, I take it as a sign we’d enjoy each other’s company. What I write is who I am. Spec Can: What pedagogical role can Science Fiction and Fantasy have to open up new questions about the environment? Julie Czerneda: I believe, passionately, that science fictional thinking is a crucial survival skill. We all need to ask questions, to speculate about possible consequences in an imaginative, yet as close to real fashion as possible, and to become able to assess incoming information in a critical, not cynical manner. Imagination is of immense use, too often undervalued. We who live and breath SF rarely appreciate what a strong and active muscle our minds have developed. I’d like everyone to have the same advantage. To ride society’s changes, rather than be swept away. To decide where and how technology best fits our needs, before it’s in our homes. Another aspect is science as a human activity. There are works of science fiction that do an admirable job of making science accessible, relevant, and, best of all, something people do. The X-Files drew a host of young women to forensics and other sciences who might otherwise have gone elsewhere. Fringe is another show that comes to mind. Spec Can: Communication plays an important role in your work. How can SF teach us to communicate better, and – especially – to listen better? Julie Czerneda: The issues involved in communication between organisms who may not even share the same sensory equipment, let alone intentions, fascinate me. They form the foundation of my Web Shifter series, in fact. Tremendous fun. In this case, I’m using SF to explore and investigate. As for our own communication? We’re a chatty species. We should chat about the science and technology that matters to us as easily and well as any daily topic, but few do. I’ve had success using science fiction with students to get them “talking science.” SF provides useful vocabulary, presented in context. Story dialogue gives examples of conversations centred about science as something immediately important to the characters. With a bit of care to choose age/experience-relevant SF, the playing field levels off. Students who’d otherwise struggle with English become just as passionately outspoken as their peers, and they do it about science. Spec Can: As an occasional university instructor, I am most interested in how SF can be used in a university environment. Could you share some strategies and ideas with us about SF in higher education? Julie Czerneda: Interestingly, one of the uses I’ve been involved with has been SF as part of science courses for non-science majors. The emphasis is on science in society, with science fiction basically used to deliver the big science ideas within the context of consequence and change. The desired outcome is to instill a questioning, curious, and aware attitude in these students, rather than a breadth of science knowledge. I’ve also worked with a professor who, for many years now, has used science fiction as an integral part of his first year astronomy course. Students take what they’ve learned about the science and apply it to alien world-building as an SF writer would do it. I’m proud to say this class has been using Beholder’s Eye (my second novel) as part of this process. Going back to your earlier question, the University of Wales offers degrees in science fiction and communication, with an enviable employment rate. We need people who can bring science to life, who can clearly express complex ideas in meaningful ways to a varied audience. SF? Does it all the time. Spec Can: What is the most exciting moment you have experienced where you saw the impact your authorship had on a student’s knowledge and excitement about science? Julie Czerneda: It’s always exciting, seeing that spark take hold. But the best moments haven’t been exciting. They’ve been powerful. I’ve sat, spellbound, in the midst of kindergarten students so caught up in imagining they lived in a space station that they began to sway as if weightless. I watched a group of noisy grade 8 students grow quieter and quieter as they worked through a science fiction scenario about limited resources, only to burst into tears when they realized that their character would sacrifice herself for her younger brother; my eyes were no drier than theirs. The shared experience. The power of imagination. The swell of emotion no less real for coming from a story. Those are the moments. Spec Can: What is the importance of imagination and a sense of wonder for our world? Julie Czerneda: What we can’t imagine, we can’t create, so there’s one. What we can’t imagine, we can’t prepare against or for, so that’s another. Imagination is essential to our survival, as individuals and as a species, and has been for eons. The sad thing is that it can atrophy from lack of use or be stunted by those who’ve lost their own. The best? The more it’s used, the stronger it becomes. I’m a believer. As for a sense of wonder? That’s how imagination connects in the most positive sense to the world around us. That’s how we know we belong. Spec Can: What important role can curiosity play in creating a better future? Julie Czerneda: What technology is to science, I suspect curiosity is to imagination. The hands at work. The application. The impulse to look beyond, because there might be more, turned into the act of looking. That make sense? Curiosity, to me, demands an open yet questioning mind. When you talk to post-adolescents, curiosity sounds like something kids do, but it’s primal and important to all of us. Children are curious in order to investigate and learn. Society has a tendency to assume the curious should become scientists or explorers or artists, but I think everyone should be, in every aspect of life. None of which answers your question, does it? Questions of privacy and personal space aside, I think we’d be better off for more curiosity in our citizens. Where you see people encouraged to be curious and ask questions for themselves, is where you see improvements being made. Spec Can: Your work seems to bridge the gap between the sciences and the humanities. In what way are these disciplinary boundaries artificial? How can we do more to evoke scientific interest in people focused on the humanities and vice versa? I understand the need to compartmentalize in order to focus, but even today, nothing pleases me more than blurring those edges. Nothing, in my opinion, does science a greater favour than the healthy mixing of disciplines. In my non-fiction science writing, I wrote in every science, but it was applying my work within the humanities, describing the people who work in science and the interactions among science and society that stands the test of time (and curriculum changes) best. It’s about listening and respect, really. Good manners rule. Everyone’s work or field is personally important to them as well as to society. Terms like “soft” or “hard” science were never useful. Yes, there’s rigour and reproducibility, but there should also be room, because any human endeavour is an art, for observation and discourse around what doesn’t lend itself to measurement. The payoff? Synergy. One of my fondest experiences of that in action was with a group of psychology graduate students. I’d been asked to bring my SF-self to the table, to help them develop testable hypotheses. They knew their field but were having trouble reaching out from it into new ground. What I brought to the discussion was a well-oiled imagination and curiosity, as well as an awareness of experimental design. We had a blast. They developed great ideas and I came away with some of my own. Spec Can: Your work alternates between Science Fiction and Fantasy and you excel equally in each. Is it tough to alternate between genres? Are these genre categories that separate? Julie Czerneda: ::blush:: Thank you. I enjoy both and yes, tough describes it. But in a good way. For me, both as an author and editor, they are different and separate. Even as a reader, I look for work that is clearly one or the other as well. Every so often I’ll read something that blends all manner of genres into a great story. Some authors can do that and I’d never suggest they stop. But it’s not an approach I’d find satisfying for myself. There’s too much risk of losing what’s special about each. Let me explain. I take pleasure and pride in what makes science fiction a speculation about the real world, by asking that one “what if …” then building a story framework that lets me play with an answer, while keeping as much of what we know factual and true to life. I’ve no problem inviting a reader to play along with FTL and aliens, but I won’t mess with anything more and there’s always a science question at the heart of my plot. What if life evolved this way or that? How might biological imperatives affect technological civilizations? Who might we become in the future? What cost is too high or risk too great, when manipulating genetics? I love how science fiction gives me insight into these and any other questions I might have. Imaginative, yes, but in a sense, imagination with gloves on, respectful of what we know. The setting of a science fiction story must be solidly built, its plot and premises credible enough that the ultimate answer presented will be accepted by the reader. That’s when, in my opinion, it works best. Fantasy, on the other hand, takes those gloves off. It must. Its questions are every bit as important as science fiction’s, but they are no longer about the world outside, but the one within. What makes us tremble in dread or exclaim with joy? Who do we want to be? Who are we now? How far could we rise — or fall? To examine those sorts of questions, fantasy shakes us from this world, the one we’re so comfortable and sure about, and drops us into one with new rules. Here be dragons. In an science fiction story, explain their presence to me or I’m gone. In a fantasy? Oh, in a fantasy, I’m wide-eyed with wonder and eager to fly too. Some stories give us clear warning of those new rules. Gates, as in Andre Norton’s Witch World series. Lewis’ wardrobe. Step through and nothing will be the same. Or no warning at all. Preconceptions must be abandoned as the fantasy weaves the strange and different around the willing reader. That interplay is when, to me, fantasy is at its best. As for what’s tough about working in fantasy as opposed to science fiction? Certainly the editing is pure joy. I’m happy with my personal “this is science fiction/this is fantasy” radar, and have thoroughly enjoyed editing anthologies of one or the other. The challenge was writing my own. I’ve admired authors who do both well. C.J. Cherryh. Patricia McKillip. For many years I contemplated trying fantasy, because I love reading it, but didn’t see myself as having the skill. To create a wholly new world for readers, a convincing fantasy world, takes a daunting command of language and exceptional writing craft. To be blunt, I find starships and slime pretty easy. Readers meet me more than halfway, so I just blurt out the ideas as a story and we’re all happy. But an immersive, wondrous fantasy world, where everything has to be created, including the rules? That was a huge undertaking. Before that point, I had to find out if I could even tell a readable fantasy story. Every so often, rather quietly, I’d write one. For those curious, my first was “’Ware the Sleeper” in 1998, published in Battle Magic edited by Martin H. Greenberg and Larry Segriff. My novella Gossamer Mage: Intended Words came out from Baen’s Universe in 2008. The gloves were definitely off. (I’ve done a couple of horror stories, not willingly; friends made me. I’m proud of them but that’s not what I am.) A funny aside to my efforts to figure out fantasy: I wrote an okay-I-suppose story called “Peel” for what I thought was an SF anthology. Turned out I hadn’t read the invitation properly and it should have been fantasy. As an experiment (and because I was embarrassed beyond words) I rewrote the story. To my astonishment, as a fantasy it was much better — powerful and dark and second person to boot. You can read that one in In the Shadow of Evil edited by Martin H. Greenberg and John Helfers. I apologize for being long-winded here, but you’ve struck a chord with this question. 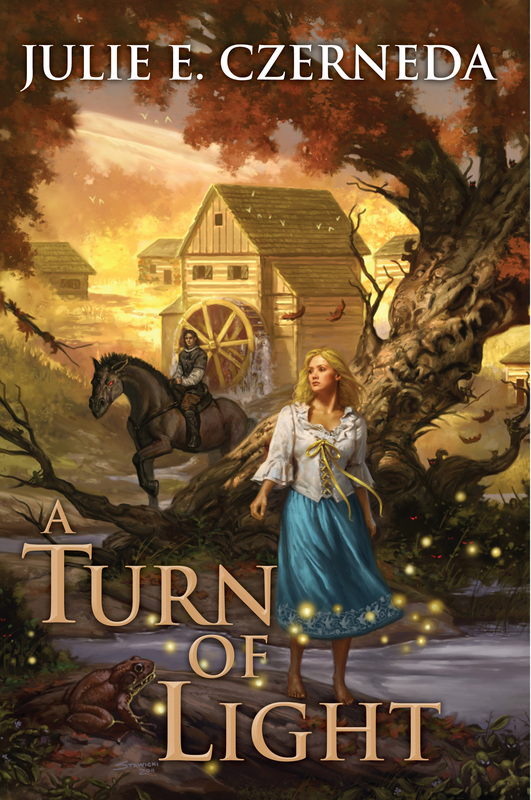 You see, my first fantasy novel, A Turn of Light will be released in stores about the time this interview goes up, and writing that book was the most difficult, time-consuming, and terrifying task I’ve ever done, as well as the most rewarding. It’s made me a better writer without doubt, but the numbers behind it appall even me. I wrote the first paragraphs over twenty years ago. I deleted well over 400K words during the writing process. Three years to write, during which I worked daily on it and couldn’t touch anything else. A final word count of epic proportions, but I’d made up my mind at the start to write a complete story. If I was going to commit fantasy, I was going all the way. Having had some utterly wonderful early feedback about Turn, not to mention it being picked up by the SFBC and Audible.com, has eased some of my anxiety, but not all. Don’t get me wrong, I love this story and believe in it. I’ve put everything I had into it. But at the end of the day, I’m a biologist turned science writer turned science fiction writer. Starships or slime, I’ll stand up to be counted. Fantasy? I enjoy and respect it. Can I write it for others to read? That’s up to my readers to discover. 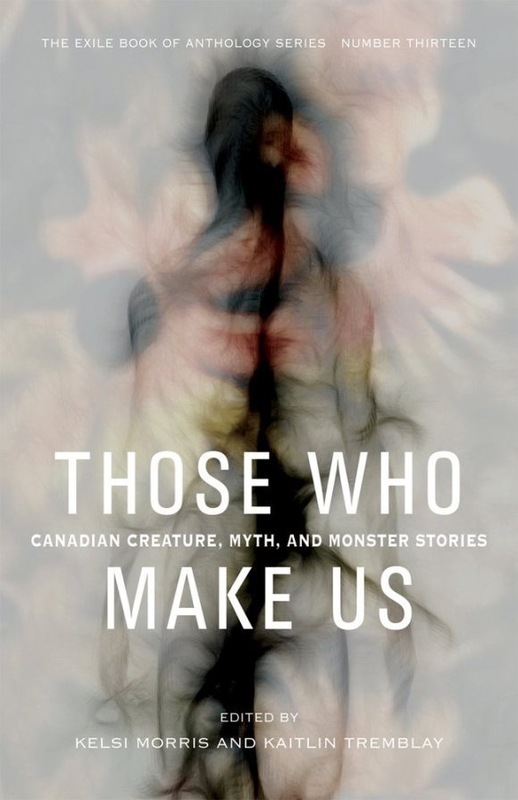 Spec Can: What is distinct about Canadian Speculative Fiction? Is there anything distinctly Canadian about the worlds and characters you create? Julie Czerneda: I believe I have the first alien pick-up hockey game. Ties of Power. I wrote it in a rink while watching our offspring play, hence the authenticity of the cold seat. I’ve named starships after our astronauts. In the Company of Others. There’s a distinct possibility that beer occurs at least once in every book I’ve written and I’ve set portions of a trilogy in Canada. Species Imperative. That said, I have an American publisher, so my words lack “u’s.” (I make a conscious effort to avoid the ones that would bug me, like colour and behaviour, but honour and armour are less easily avoided. I can live with that.) I would like to point out that my American publisher, DAW Books, treats its Canadian authors (we are legion) extremely well and we try to do the same in return. Of course they do well by all their authors, but we Canucks are something of a club and proud of it. On a more serious note, and “u’s” aside, how could my work be anything but Canadian? for that’s what I am. My stories lack villains. I like resolving incompatible-seeming goals. I value diversity and expect everyone to queue nicely, even if they can’t quite get along or smell funny. Weather’s often an issue. The endings I prefer don’t have winners and losers, but change and accommodation. I’m optimistic, not solely a Canadian trait, but something being Canadian makes me determined to share. As for Canadian SF? We have wonderful, imaginative, thoughtful, ground-breaking authors all across this country. If I had them in a room, I’d give them each a beer (or beverage of choice) and force them to wear a pin that says “World-class Talent” for an hour. Of course they’d take it off outside the door. Yes, being Canadian makes it slightly naughty to tell anyone how great we are, but there is a way around it. I sincerely hope we learn to talk more about each other’s great stuff. You there. Reading this. You’re GREAT! Now get back to your own writing. Julie Czerneda: No to the first bit. My characters are very much my creations and serve the story. I don’t start writing until I know how they would react in any given situation. I’m always aware of the need to convince my readers these “folk” are real and if a character doesn’t fly as he/she/it should, to me that indicates a problem to be fixed. That said, I love how a story, through its characters and plot, develops momentum and direction once there’s critical mass. The notions my “hindbrain” comes up with when I’m in the shower or about to doze off delight and sometimes surprise me, but I consider that still part of my process. As for personalities? Oh yes, if I’ve done my work properly, characters develop personalities that resonate for me and hopefully for readers. I adore Esen. I have my Mac moments. I wouldn’t want to face such difficult trials as Aryl or Sira or Aaron but I assuredly know their natures and trust they can and will face them. Jenn Nalynn, my latest, is different again and I can “hear” her laugh. Such are the end results of the craft, of putting enough into each character that they are believable and, I hope, as admirable/vile/adorable/or annoying as I intended. What does amaze me is how readers respond to minor characters. I expected the main characters to take hold of a heart or two but not that my walk-ons would have their own fans. These days, I take such great glee in adding details where I know they’ll be appreciated. Spec Can: What is your favorite mythical creature and how has it inspired you? Julie Czerneda: “I was never a unicorn or fairy type. Dragons called to me. Power, attitude, age. Those are the ones I like. Tea with the Black Dragon by R.A. MacAvoy remains a favourite. The early Pern novels. There’s a YA I remember very fondly from long ago and have tried to find again, about an injured dragon whose wing is darned with spider silk. If anyone can tell me the title/author, I’d appreciate that. I’ve waited until my latest novel to put forth my own version. Ironically, though I once daydreamed about having dragons on one of my book covers, I produced a dragon who couldn’t be. Spec Can: What current projects are you working on? Julie Czerneda: If I could write more than one book at a time, I’ve readers who’d be happy. I’ve six novels contracted with DAW at the moment: the concluding trilogy of THE CLAN CHRONICLES, another Esen story (yay! ), a new standalone fantasy, The Gossamer Mage, and, much to my delight, a sequel to Turn called A Play of Shadow which I truly hope won’t take as long to write. It shouldn’t. I’ve some confidence now about that fantasy stuff. I’m also making notes for some other projects. I’ve questions, you see. Julie Czerneda: Whether it’s fantasy, science fiction, or answering thoughtful and thorough questions such as these, what you read is me. Give A Turn of Light a try, even if you’re unsure about fantasy. I hope, if you do enjoy the story, that you’ll read the acknowledgments at the back of the book as well, for DAW’s given me several pages to talk about this book, my journey through it, and to thank the very many people I owe. Now? It’s time for a new story to come to life in your hands, dear readers, and for me to settle back and create the next. Hmmm. Where was I? Right … Winter stretched its icy fingers across Marrowdell in the early hours before dawn, crisping leaves and polishing the commons pond with a skin of ice. It breathed traces of snow over the crags and into crevices, snow that, like rain, avoided the Bone Hills altogether. It sighed at the rising sun and retreated, for now, leaving the air sparkling with frost. What can I say? I’m Canadian. I want to thank Julie Czerneda for doing this interview and sharing her incredible insights with Speculating Canada. I am hoping that her insights about the environment and ecology as well as the importance of a good imagination will help us to speculate a new and better world for tomorrow. To read more about Julie Czerneda’s work, please visit her website at http://www.czerneda.com . Her website also includes sources on teaching the sciences through SF, so if you are a teacher, there are incredible resources that you can bring into your classroom.